Bailey Hikawa calls her show an illusion. It's amazing what some faux-marble tiling can do to a space like Important Projects' modestly sized gallery, which is otherwise completely white-washed but for an old fashioned hearth. 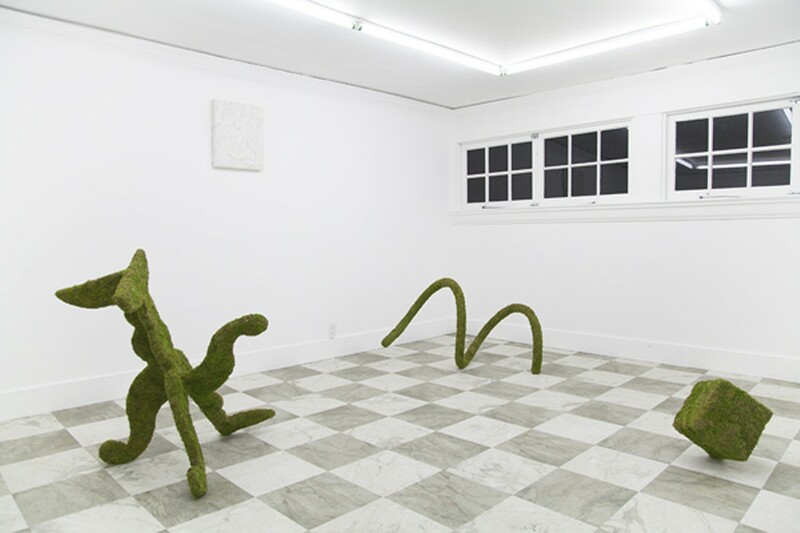 Bailey Hikawa's addition of gray-and-white-checkered flooring, part of her exhibition Emperor! Emperor! Emperor!, serves as both background and frame to an arrangement of three (if you count the fireplace fixture, four) odd objects: a tilted cube, a curly spring, and a partial dining room table, all covered in topiary, above which hang two pastel-hued oil paintings. Through this mock-regal scene, Hikawa references the power dynamics established by systems of display — in particular, how the mannered gardens of an emperor such as the one heralded by the exhibition's title serve not only to provide pleasure for the palatial residents but also to intimidate his subjects, symbolizing the despot's role as tamer of the unruly masses as well as his position of total dominance over everything, the natural world included. "In making the work I was interested in how illusion and power are co-dependent," said Hikawa. "The show is an illusion in the same way the emperor is an illusion. He is a man, but also an idea of man." 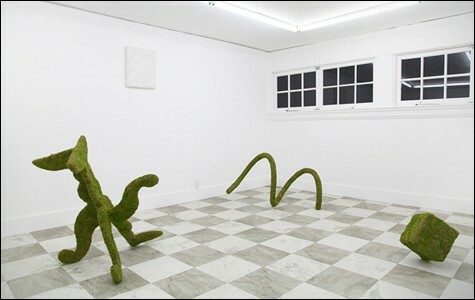 Of course, Hikawa's installation makes for no ordinary mannered garden. In the context in which the artist works, the checkered plane takes on a distinctly surrealist inflection, evoking the vague expanse of a Dali canvas, the dream worlds of David Lynch, or the virtual reality of computer graphics. Indeed, in many digital editing programs, planes of gray-and-white checkers are used to indicate empty space. Here, too, one perceives a void, as the topsy-turvy objects appear untethered by gravity. In their topiary green they stand out strongly against the grid, accentuating their formal ambiguities. Under these conditions the ornate table leg takes on the form of a coyote performing a jig, or perhaps even, as a child in the gallery mystifyingly interpreted it, an ocean. Hikawa does not merely reference a particular strategy of dominance, then, but also exposes the primordial space of endless interpretability from which all power structures, being essentially illusion-based, came into being, but which they must deny. "Thinking about this installation, I knew I wanted the gallery to be a stage and ultimately a canvas," she said. "I think this is why the grid, the checkered marbled floor became important, because it is not only a matrix, but also a [pictorial] ground prepared for the sculptures." Framing itself somewhere between the scenic and the pictorial, Hikawa's installation sets itself in opposition to the authoritarian garden, inviting viewers to participate in determining what in the world these strange shapes might mean.